If you were shopping for a bicycle and the salesman told you, “What you really need is a car. A car does all of the things a bike does and so much more—and only for a few thousand dollars more,” then you would probably laugh him off and walk away, Right? Well if you’re looking for a simple word processor to write reports or memos on then that’s exactly what Microsoft Word is doing—it’s offering you dozens of features you just don’t need and then it wants you to pay for them. A copy of Microsoft Office with Microsoft Word can cost upwards of $399.95. Why pay all of that for features you won’t use and a program that is so bloated with bells and whistles that it gets in the way of simple word processing? Most people end up with Microsoft Word simply because they are not aware of the other choices. Meet AbiWord , your word processing solution. 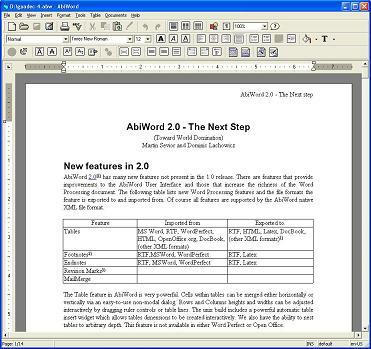 AbiWord is a simple, stripped down word processor. AbiWord works on just about any operating system and just about any computer—Windows, Mac OS, Linux, you name it. With MS Word, your files have dozens of little additions that make the file hard to read for anything besides MS Word. With AbiWord , not only can you save in any file type you like, but you can open almost any file too. Finally, the most important feature of AbiWord; it’s free. AbiWord is opensource and opensource means that some kind souls somewhere are pounding away at keyboards so that you can use AbiWord at no cost. You need a word processing program; something a little more advanced that raw text in Windows Notepad, and something with a little less weight than the monster that is MS Word. 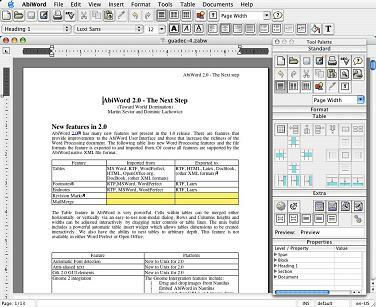 With AbiWord you have all of the functionality of a modern word processor without the fuss and cost of the competition. AbiWord has comparable features to any of the other word processors on the market and, because AbiWord is open source, it’s free and it will keep on getting better. If you need more than the bare minimum but don’t need or don’t want to pay for all of the features of Windows Word that you don’t need, go for AbiWord and get just as much word processor as you need.